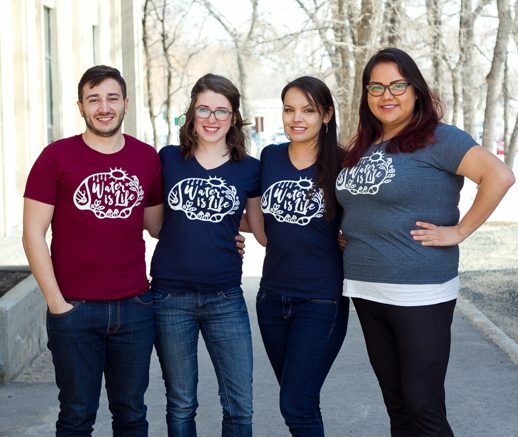 The Student Pipeline Action Committee (SPAC) is leading a fundraising drive selling tee-shirts to support the legal defence of protesters arrested in Standing Rock, North Dakota. The campaign closes March 24. The page can be viewed here: squareup.com/store/student-pipeline-action-committee. Photo submitted by Alyssa Bird. A group of first-year University of Manitoba law students are throwing their hat into the debate over North American pipeline construction. The Student Pipeline Action Committee (SPAC), which formed in January, emerged out of a constitutional law course that drew upon the then-ongoing Standing Rock protest in North Dakota. Thousands of protesters contested the construction of the USD$3.8 billion Dakota Access Pipeline – which has since been completed under the Missouri River – for more than six months. The blockade drew international attention to Indigenous land rights in North America. The United Nations recently issued a report critical of the United States’ handling of the project, including its failure to consult with the Standing Rock reservation which draws water from the river. Between August 2016 and February 2017, some 700 protesters were arrested in an enforcement response that at times turned violent, including the use of rubber bullets, tear gas, and water cannons in sub-zero temperatures. “The example that was posed to us – which is actually a very real possibility – was that similar protests and blockades will erupt here,” said SPAC executive member Danielle Morrison. In January, the Assembly of Manitoba Chiefs filed a motion in court challenging the Enbridge Line 3 Replacement project. The more-than-1,600 kilometre pipeline – which will run from Hardisty, Alta., through southern Manitoba and into the U.S. to Lake Superior – was approved by the National Energy Board in April and given the go-ahead through a Nov. 25 order-in-council. “There is a real possibility that more conflicts will be occurring on our side of the border here in Canada,” said Morrison, citing the potential resistance to the Line 3 development. The SPAC held its inaugural meeting in February and struck a fundraising campaign selling tee-shirts to support the Water Protector Legal Collective, a team working to provide advocacy and support for protesters, branded water protectors. “Law students are always looking for an opportunity to practice and refine our skills,” Morrison said. Morrison noted that Standing Rock protesters displayed Najavo and west-coast Indigenous artwork and said the woodland design brings a regional flavour to a universal theme. SPAC is also building relationships with other like-minded organizations, including Divest Winnipeg, and aims to assist communities fighting to protect their Indigenous territories. “The problem that I’ve always come across with these types of legal issues is that people don’t understand what their rights are,” she said, adding that while the students can not provide legal counsel, they can offer guidance and support. The next SPAC general meeting is scheduled for March 28 at noon in room 207 in Robson Hall. Second-year law student Rayanna Seymour attended the first SPAC meeting and said she immediately supported the fundraising drive by purchasing a shirt. She said SPAC provides a valuable space for an open discussion on pipeline construction and broader conversations around resource extraction and Indigenous land rights. In November, Seymour was among a contingent of U of M students that travelled to Standing Rock to support the community’s protest. “We were there to stand in solidarity with the Sioux, with the Lakota, on their lands and to help in any way we could,” she said. Seymour said the conversation around resource development needs to reach deeper than a simple economic question of money versus water toward a more serious examination of what will be left behind. “It’s not just a fight for Indigenous peoples – it’s a fight for everybody,” she said.